For some reason I deem it necessary to read the comments underneath Facebook posts. It gives me a better idea of general public perception of whatever video I am choosing to watch (albeit, often those videos are often of silly cats doing ridiculous things, or children singing Elvis in the back seat of their parents cars. Seriously, what is wrong with me? I ALWAYS click play. ALWAYS. I can’t pass up a video!!) ANYWAY, I follow Birchbox on Facebook. They are a fun company that ships you monthly boxes of skin, hair and makeup goodies. If you haven’t yet had a chance to experience them, I wrote about them here, and did a review of them in April of 2013, here. Recently this video was posted, and got a TON of response- so much so that even Good Housekeeping shared the video on Facebook (yes, I follow them TOO!) The comments under the video were interesting, to say the least. I am always amused by the people who claim to have “official knowledge” because they are .. “x,y,z” and that makes them more qualified than anyone else. On this particular day , one commenter took it upon herself to say “This is the dumbest thing I have ever seen! That is not ok for your skin. There is no way it works. I should know, I’m a MUA.” I.E- She is a “makeup artist” and therefore she has the “official knowledge” as to why it doesn’t work. I never comment. Ever. However, I did on that one because it just rubbed me the wrong way; possibly, because she started it with saying this woman’s idea was “dumb.” Grr. Let me tell you why THIS WORKS. Everything boils down to the color wheel. If you are in any creative field, it is the foundation of all color theory. 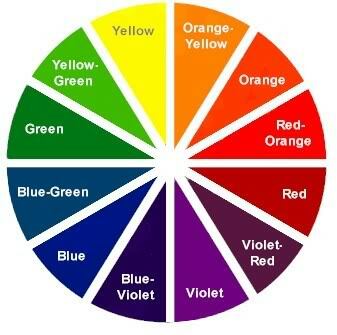 Without boring you to death with the explanation of what the color wheel is and why it works, let me just tell you this- if you want to cancel out a tone, go directly opposite of it on the color wheel. So- Green cancels out red; blue cancels out orange; yellow cancels out violet. Got it? Great. So why did this lipstick work for her? First- Her skin tone. Second- the color of the circles under eyes. She has a lot of yellows and greens in her skin, and her circles are “blue,” combined with those greens. So… what is opposite of green? RED! There is your answer. She canceled out her blue circles with a lipstick color that contains orange in it (BLUE -> ORANGE) and the red in the lipstick cancels out the green tones in her skin. Is it worth a try for you? Sure, why not? I tried it. I opted for eyeshadow in a warm peach, because despite my prayers, I am still just as fair today as I was yesterday. If you have a more fair complexion, opt for a softer color, going more toward red-orange or orange, rather than pure red. You may have to play around with different colors, to see what works best for you. Trial and error, it’s how we all learn. So, it’s Monday. You all stayed up too late watching the Super Bowl, or, like me, chose to research various makeup artist YouTube channels, talk to friends, and write a post for your blog- and you are lacking in sleep. Monday is the PERFECT day to try out this technique to cover up those raccoon eyes! Tags: Advice, Atlanta, atlanta blog, Atlanta Hairstylist, Atlanta Makeup Artist, Beauty, Beauty Advice, Beauty Blog, Beauty Box, Beauty Budget Blog, BIRCHBOX, blog, Budget Beauty, Budget Makeup, Cayla Does Hair, cover up, Facebook, Good Housekeeping, Lipstick, Makeup, tips, tricks, under eye cirlces. Bookmark the permalink. Previous post ← Clean it up. I bought pink & green concealer once – green to tone down redness & pink for under my eyes – only one day, I accidentally used the wrong one and put green under my eyes. They were ready to send me home from work because I looked soo sick!